﻿It's been three years since the devastating accident . . . three years since Mia walked out of Adam's life forever. I was blown away by "If I Stay" when I read it back in 2009. And honestly, I really loved the ending of it. 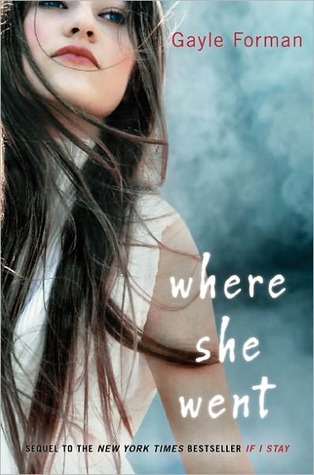 I almost didn't pick up "Where She Went" when it came out, because to me the story was already perfect. It was only after countless glowing reviews and my dire need for more Adam in my life, that I decided to pick it up. Where "If I Stay" blew me away, "Where She Went" overinflated me until I exploded into millions of sparkles. This is absolutely in my top five favorite books of 2011. Gayle Forman is such a gifted storyteller and her writing is so wonderful. I loved living in Adam's head this time around. He's such a great male lead, because he's totally messed up and has the bad boy thing going for him, but he wants to be better. And come on, boys in bands are crazy hot! The book is kind of reminiscent of the movies "Before Sunrise" and "Before Sunset", I don't know how many of you know those movies, but it definitely reminded me of them. That's a good thing, though, because the movies are kind of awesome. Anyway, we basically spend an entire night following Adam and Mia around the city, while they get reacquainted. They haven't seen each other in years and after attending Mia's show, she invites him backstage, they chat a bit and then end up hitting the town. So much has changed since we last saw them. They are both famous now, Mia with her cello and Adam with is band, Shooting Star. You would think fame might make them less likable, but it hasn't. Both of them have grown up a lot, but in some ways they are still the same. Fab review, I was nodding along to everything you said. LOVED this one!